Greening Our Life: Oh bugger! Every plant has been pulled out and chomped. There are only the remnants of leaves and roots. They also ate the top off the lettuce that I was allowing to go to seed, flattened half of the onions, ate the parsley that was in a pot down to the stubble and because the beds were wet from the rain, left inch deep paw prints through most of the beds. 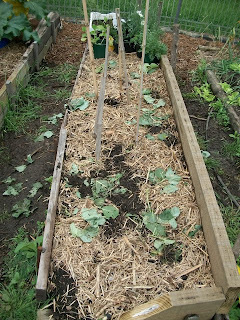 On the plus side, the carrots look okay, as do the onions that were along the lower edge of bed 3. I think the bean seedlings will pull through as they only look a little knocked, not ripped out. The strawberry plants are okay, though there is not a red strawberry in sight. They also appear to have left the rhubarb alone. So on a positive note, it could have been worse. But still...BUGGER!